It is currently Tue Apr 23, 2019 2:02 am. I didn't know this was possible, but I was grey inside my own house and someone riding by was able to target me and killed me with some fireballs. I'm a newb, obviously. I assume the PK was able to target me because they were able to get close enough to the door to see inside my house. Or is there a targeting method I am not aware of. How can they send fireballs through house door/walls to kill me? I had no idea this was possible. By the way, I was grey because I was killing another characters summoned creatures to gain combat skills. Anyway, I learned something new today (or relearned, it's been years since I've played this game and just started up again). They can meteo swarm the house side which will shoot fireballs up to 2 tiles into the house. 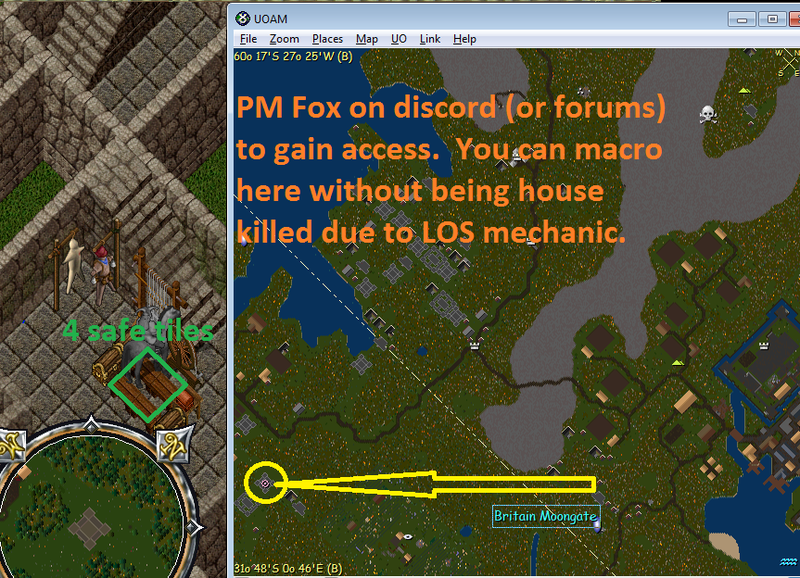 You have to stand in the exact middle of a small house to macro safely. That explains how he could still kill me when hidden since when I realized he was attacking me I tried to hide myself... still got me. Just so you know too, if you get yourself a patio house and you leave the patio doors unlocked someone can telekenesis those doors open and get a blade spirit into your house. Proselyte, thanks for the extra info! My wife and I died this way in her patio twice before someone told me that could be done. Thank Razor for restock agents! Here is a similar situation i could use help with, a friend of mine was macroing on the second floor of my two story L shape. He had two characters up there and both got it. I didnt think you could get whacked on 2nd floor. Any ideas? On this server the LVL on which u stand does nothing. EQ and Meteor Storm can still hit you. So even if your on the roof of your TOWER, if ur too close to the edge, your at risk!